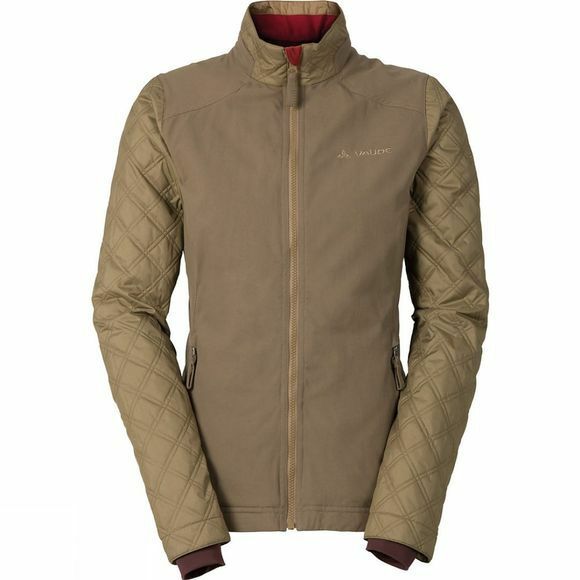 Cycle in style in low temperatures with the Women's Cyclist Padded Jacketw. The top-quality PrimaLoft insulation retains your body heat and at the same time ensures good breathability while cycling. The longer back has been designed to offer optimal insulation in the sensitive kidney region; large reflective prints on the back guarantee good visibility in traffic. This all comes packaged in a fashionable canvas look with a casual cut and quilted sleeves. This product was manufactured with Eco Finish and is eco-friendly, water repellent and fluorocarbon-free (PFC-free). Green Shape is Vaude's guarantee for environmentally friendly products – made from sustainable materials, resource-conserving manufacturing and fair production.